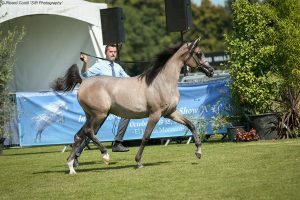 The ever-popular Arabian Horse Organization Chantilly Show was held between 2 and 5 August. 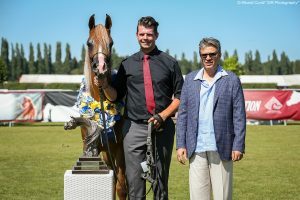 The show was split into two events – the AHO World Cup and the AHO Breeders’ Championships Europe. 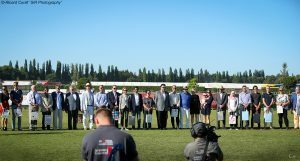 The Breeders’ Championships were held on 4 and 5 August, judged by Abdullah Al Mokbel, Jerzy Bialobok, Regis Huet, Jaroslav Lacina, Dr Bruce McCrea, and Renata Schibler. 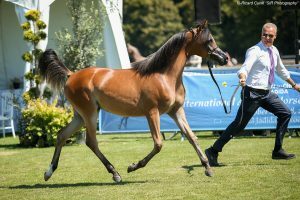 As ever, the yearling fillies began the show and winning the first of two classes was MM En Vogue (FA el Rasheem x MM Esplendida), bred by Mario Matt Arabians. 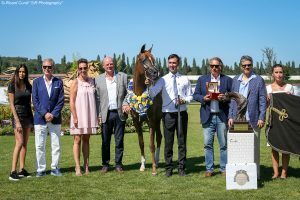 Taking second place was Knocke Arabians with Pearl Eden KA (QR Marc x Prisma De Lafon), while Jadem Arabians placed third with Dana J (Excalibur EA x Dalia J). The second yearling filly section saw a second win for Mario Matt Arabians, as MM Sabea (WH Justice x MM Santana) took top honours. Jadem Arabians were second with Furla J (Emerald J x Fudala J) and Nadrine Koo was third with KA Wahidah (Magic Magnifique x Wolante). The two-year old fillies saw a win for Armada Arabians with Yvie (Ascot DD x Yokosuka F). 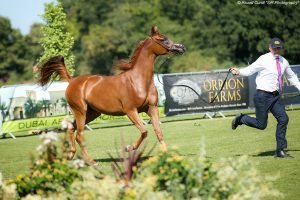 Knocke Arabians were second with Thalita KA while Jadem Arabians this time placed third with Merida J (Emerald J x Magnificent Lady J). 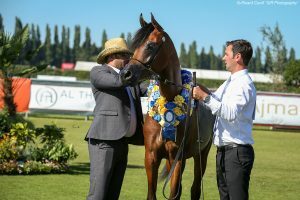 Al Hevan Arabians won the three-year old filly class with Esmaelia Al Heavan (Emerald J x Ekisma Al Hevan). 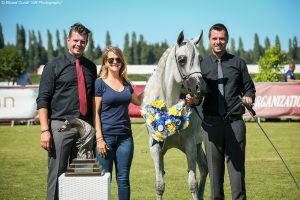 La Movida Arabians stood second with Basilea El Justice (WH Justice x Bali El Marwan), while Ancient Arabian were third with Tabaskco’s Marc Melody (Tamarisk x Morrigan KA). 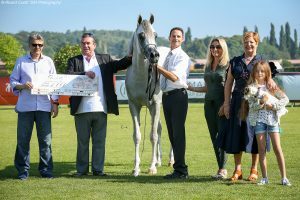 On to the mares and winning the class for four-to-six-year old mares was Jadem Arabians with Marrakech J (Emerald J x JA Ultima). 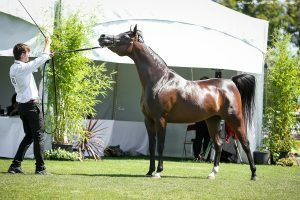 Sadunga el Marwteyn (ZT Marwteyn x DG Sunhari) stood second for La Movida Arabians, with Vvivacious (Vivegas x Adeeba) third for KK Arabians. 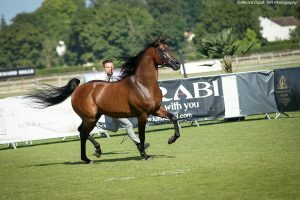 La Movida Arabians took top honours in the senior mare class as Rihanna el Hadiya (Al Hadiyah AA x Reza El Bri) took the win with Verlenzia (Vervaldee x Legacys Sonata) second for Tucana Arabians. 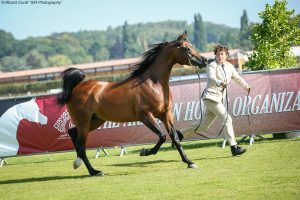 The yearling colt classes were also split into two sections, and Justify KA (QR Marc x Jolfa De Nautiac), already a big winner this year, took the win for Knocke Arabians. 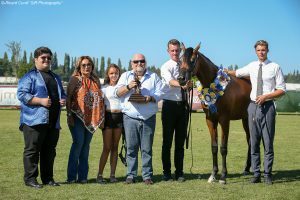 In second place was Duke Santonio ME (Santotini x Amaliaa) for Dawn Cascoe and Malik Morrison, while Magic Apal-S (SMA Magic One x RA Anila Apal) was third for Mr and Mrs Lievrouw-Seynhaeve. 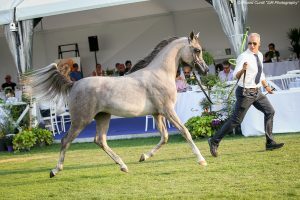 The second section was won by Flavie Allman’s Achilles Domitia (EKS Alihandro x HG Sweet Fantasy), with Bouche Arabians in second place with CBA Illias (Lawrence El Gazal x Ilena El Aryes). Knocke Arabians stood third with Poseidon KA (Equiborn KA x Primera Marc). 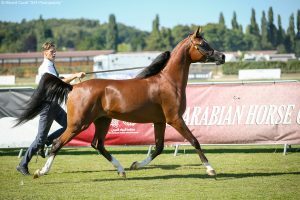 CBA Mattheus (Fadi Al Shaqab x Maharani CF) won the two-year old colt class for Bouche Arabians ahead of Emperor KA (QR Marc x Exposita KA) in second for Knocke Arabians. Third place in this class went to Joy Horses with Luiz Joy (Marajj x La Fortunata). 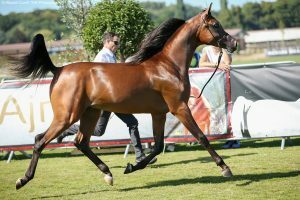 The winner of the three-year old colt class was Styx Kalliste (Shaghai EA x L’Asaalmah) for Kalliste Arabians. 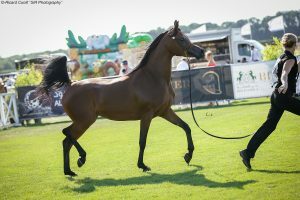 Aja Romeo (EKS Alihandro x Aja Sabiba) was second for Aja Arabians, while Cheverione (Ajman Moniscione x Judals Little Kiss) took third for Carradale Arabian Stud. 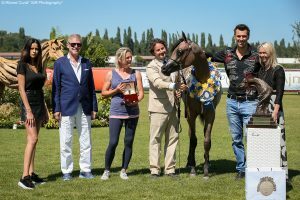 On to the first of two stallion classes, and the win went to EA Arjen El Marwteyn (ZT Marwteyn x Ancholy Ali) for EOS Arabians. Feuer Jade (Ajman Moniscione x Neva Bint Volga) stood second for Vieider Ivan. 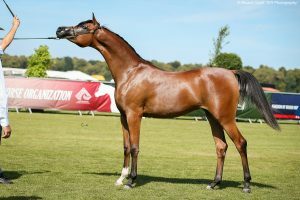 Absolut de Djoon (QR Marc x Almeria de Joseph) won the second stallion class for Karine and Nicole Pinchinat, while Georgian Arabians stood second with SG Imagine (WH Justice x SG Hessta Shaklana). The show concluded with the championships. 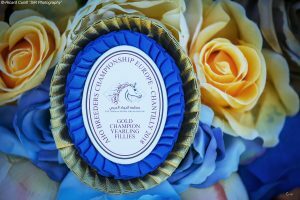 The Gold Yearling Female Championship was unanimously awarded to MM En Vogue with Pearl Eden KA in Silver and Furla J in Bronze. Rihanna el Hadiyah took the Gold Senior Female Championship with Marrakech J in Silver and Sadunga el Marwteyn in Bronze. 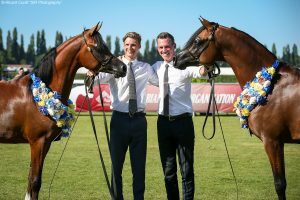 Justify KA and Poseidon KA stood Gold and Silver in the Yearling Male Championship, with CBA Illias awarded the Bronze. In the Junior Male Championship, Styk Kalliste took the Gold, with CBA Mattheus Silver and Aja Romeo Bronze. The final championship was the Senior Male, with the title going to EA Arjen El Marwteyn. Silver was Feuer Jade while Absolut de Djoon took the Bronze. This is always a popular show, and we can look forward to next year’s event with interest! 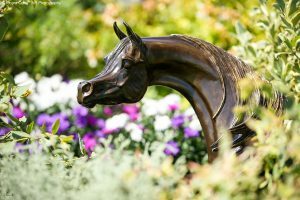 Find out more about the Arabian Horse Organization at www.ahosite.org.